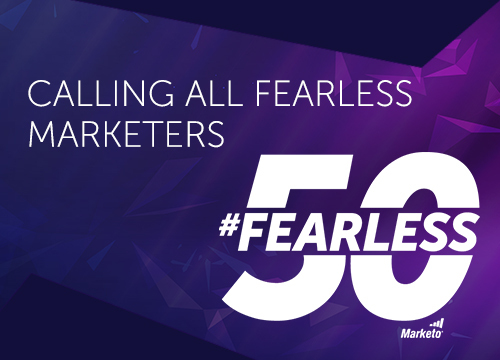 Marketo is excited to announce the Marketo Fearless 50, a program to recognize the top 50 marketers in the world who are driving bold, fearless marketing and digital transformation. Whether a CMO, a rising star, or someone just starting out, this is a chance for every marketer – regardless of the tools they use or the customers they serve – to showcase how they or a marketer they know goes above and beyond to fearlessly drive success. This yearlong initiative is designed to help honorees develop as leaders, no matter where they are in their career. Marketo’s Executive Leadership Team will review nominations and select the 2018 class of the Fearless 50. We look forward to seeing how fearless you are! Deadline to submit for the Fearless 50 is Thursday, May 31st.